Height Dominance in Parrots - Fact or Fiction? 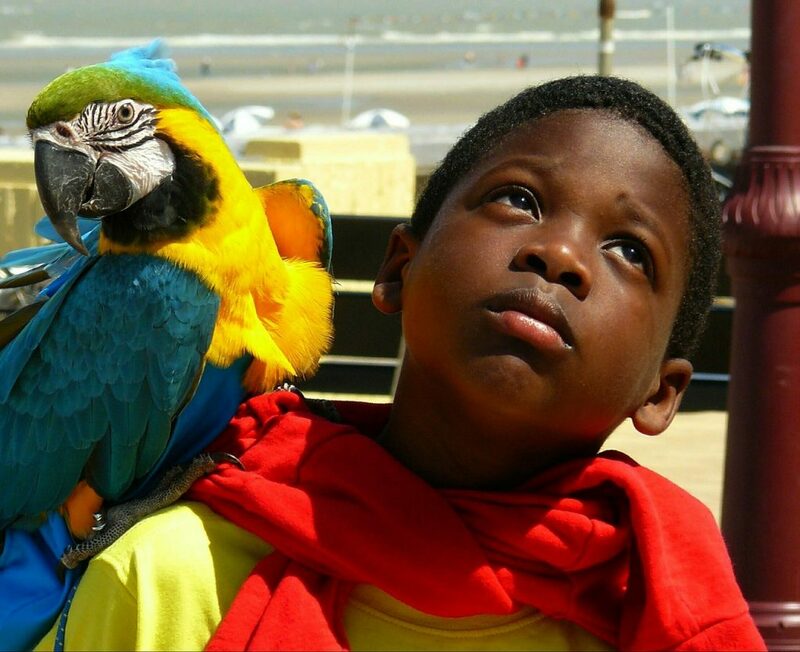 A question that is often asked by companion parrot owners is – should birds be allowed on shoulders? From the Winter 2016/17 Edition of PsittaScene Magazine. Get a free subscription with your WPT membership. “To put it bluntly, height dominance does not exist in parrots. It is most likely just a projection of someone’s personal beliefs that for some seem to make sense when applied to parrots. It is easy for some parrot owners to misinterpret aggression as a parrot’s desire to dominate. 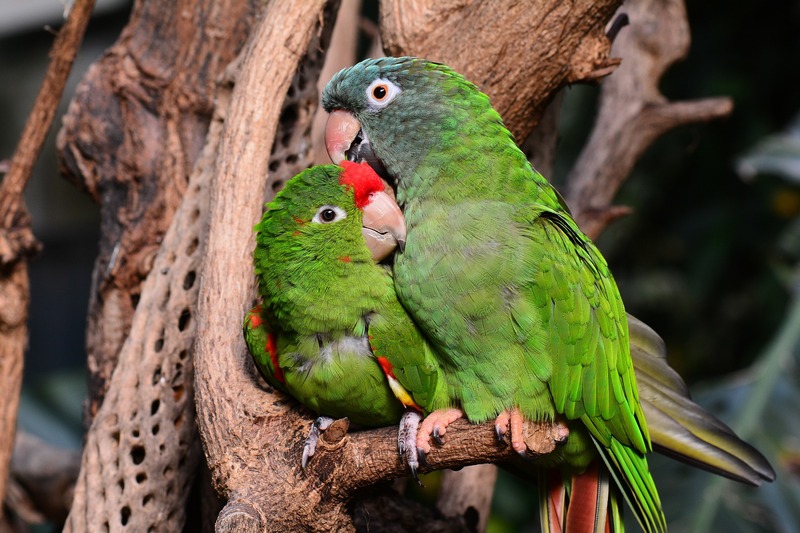 Aggression for the purpose of establishing dominance is common in many mammal species, including humans, however it does not occur in parrots. Parrots have no natural inclination to form dominance-based hierarchies with other parrots in the wild, or with humans in captivity. 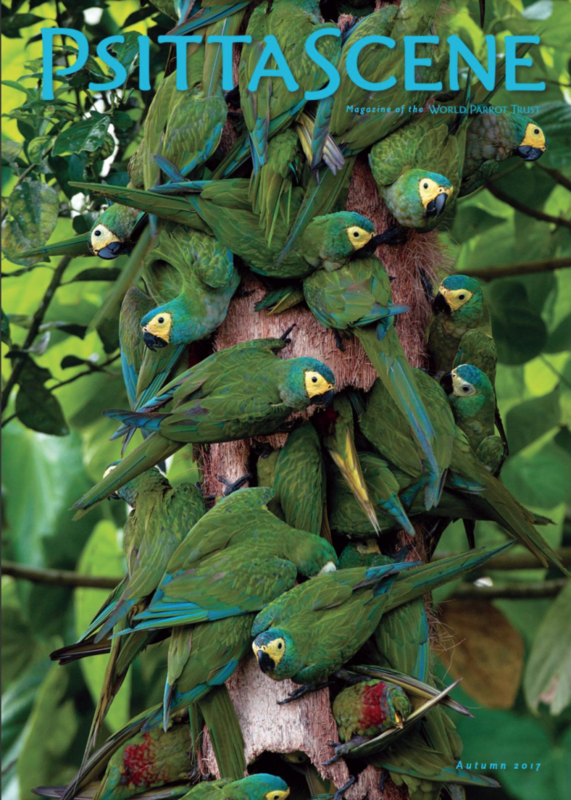 ~ Steve Martin, President, Natural Encounters Inc.
Talking to those in the know – ornithologists, field biologists, and wild bird behaviorists – there is no such thing as an alpha parrot. Aggression between wild parrots is brief, and a parrot that loses in one confrontation may very well win in the next. A frustrated bird owner may question that. “Well, of course my bird gets dominant when he’s up high. He bites me every time I try to pick him up from somewhere high,” that person may say. My response to that? 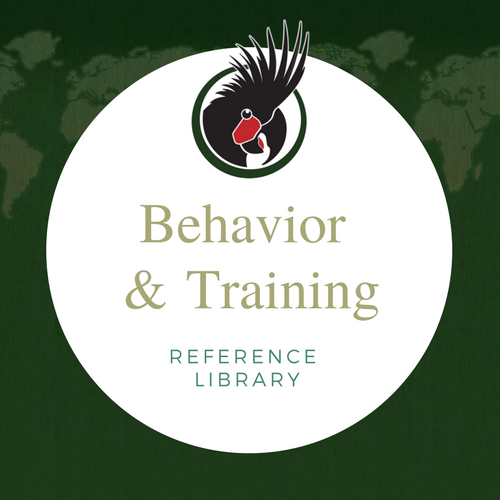 Let’s do a little behavior analysis and look at a scenario that bird owners frequently use as an example of their pet showing ‘dominance’: Butch – a macaw – is on top of his cage playing with a toy when his owner, Suzy, needs to put him into his cage. She reaches for him and when he steps up, ‘without any warning’ (as is often described) he nails her. • Birds are more comfortable stepping up. However since Butch is up high, unless Suzy gets on a chair, more than likely he is needing to step down to her and may even catch his long tail on the cage. Not very fun for Butch. • Before Butch actually bit Suzy, he tried to show her he didn’t want to step up by pinning his eyes or other body language but she ignored or didn’t pay attention to it. Therefore biting her is the only behavior he can do to get the message across that he really does not want to step up at this time. So, now, is this really a case of height dominance or is the bird simply behaving to escape something negative from the bird’s point of view? Now back to the original question. Is it okay to let your bird on your shoulder? Well, there are a number of factors to take into consideration with regard to that decision. None of them have to do with height dominance. What is your relationship with your bird? Does your bird reliably ‘step up’ onto your hand? One problem with having your bird on your shoulder is that you can’t see his body language. Therefore you can’t effectively allow your bird to communicate a fear or aggressive response, thus you may be setting both of you up for a possible bite. Another consideration is that, while it’s fun companionship to wear shoulder birds it’s healthy to offer a variety of enriching activities for your pet that encourage independent play, foraging, and more. Encouraging your bird to stay perched in one place for long periods of time limits the time he could be learning and playing in different ways. I do want to just mention that if it is a goal of yours to let your parrot on your shoulder, a good first goal would be to teach a reliable ‘step up’ behavior. Lisa Desatnik, CPDT-KA, CPBC, is a certified parrot behavior consultant through the International Association of Animal Behavior Consultants (IAABC). 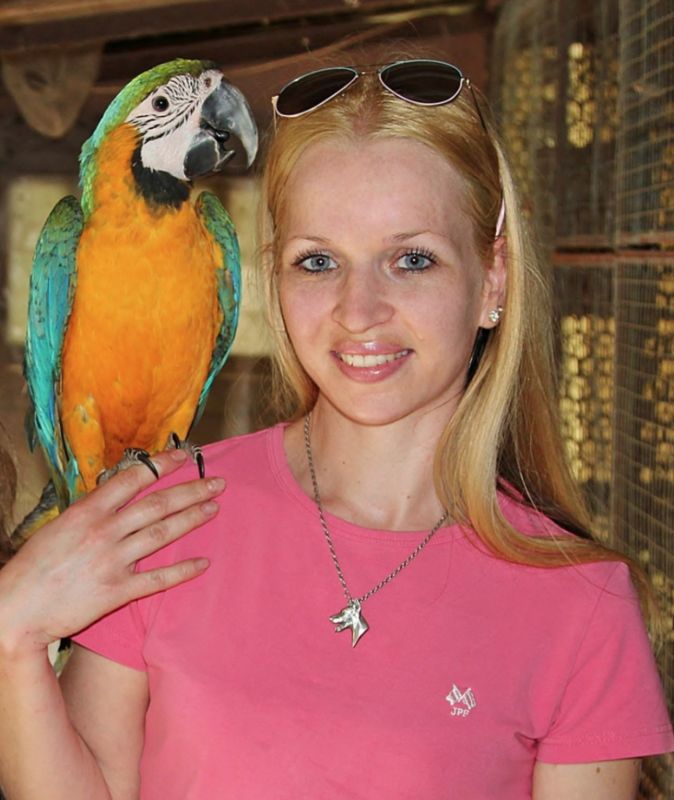 She is a pet trainer (working mostly with dogs, but also offers parrot behavior consulting) in Cincinnati, Ohio. She has been a student of positive behavior management and Applied Behavior Analysis since meeting and being inspired by her first teacher, Dr. Susan Friedman, Ph.D., professor emeritus, Psychology Dept. at Utah State University. 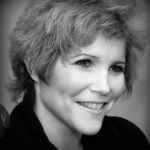 Lisa is also a member of the Association of Professional Dog Trainers and the Pet Professional Guild. Find Lisa’s behavior blog online at: SoMuchPETential.com. This article was originally published Winter 2016/17 in PsittaScene magazine. © Copyright 2018 World Parrot Trust. All rights reserved.